The new Rotary year dawns with the annual handover beckoning the new top team to take the reins and continue the traditions and "Service" of nearly one hundred years. 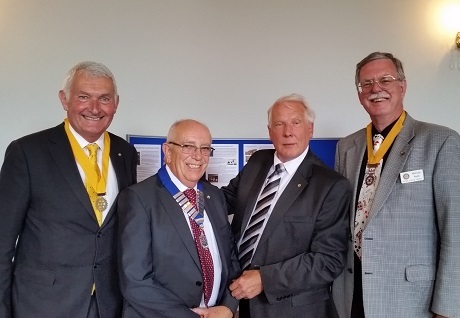 IPP Stephen Pope, breathes a sigh of relief, and hands over to President Bill Lee, flanked by Malcolm Webb, President Elect and John Cawdell, Vice President. Good luck to the new team.